Giant, sweeping glass ceilings. Indoor forests and hammocks for people to sleep on between flights. These are some of the elements proposed by the five architectural groups selected as finalists to rebuild O'Hare's Terminal 2. It's all a part of O'Hare's massive $8.5 billion dollar expansion plan. And city officials want to hear what you think about the new designs. The five proposals are on display downtown at the Chicago Architectural Foundation and at O'Hare's current Terminal 2. City officials say they want the building to make a dazzling first impression on travelers coming through O’Hare. 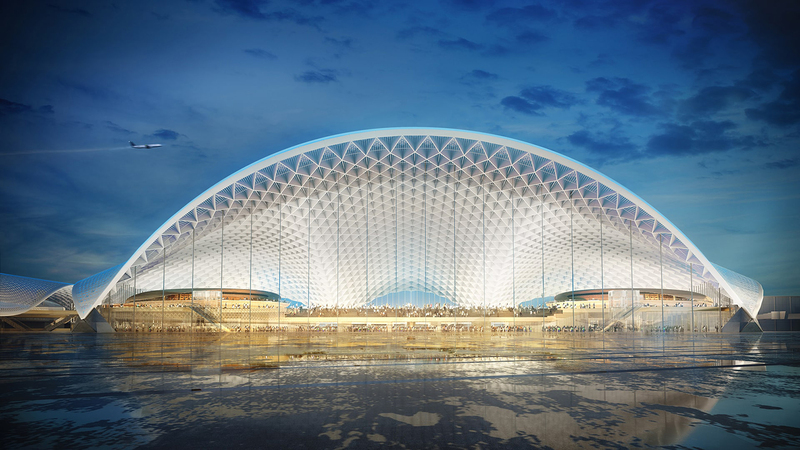 “Just imagine as they're getting off from China, Japan, Kenya, and this is their first experience of America, our O'Hare,” said Mayor Rahm Emanuel at an event this morning unveiling the designs at the Architecture Foundation. “This is Chicago, we want the best, and we want an experience that is from the curb to the gate, is revolutionary, uses the most modern technology and is the most accessible,” said Chicago Aviation Commissioner Jamie Rhee. City officials said they selected the five designs out of 12 submissions, and they are asking the public to weigh in at VoteORD21.com. Officials said 1,000 people had already voted in the poll’s first few hours. The final say, though, will come down to a secretive selection committee. The mayor's office declined to release the names of committee members, but an airline spokesperson said American, United and other carriers will play a role. “We'll hand all the data over to an evaluation committee for them to use when they're evaluating the proposals,” Rhee said. The proposals range from an undulated roof design from Fentress-Exp-Brook-Garza to a massive, curved main hall designed by Foster Epstein Moreno JV. The design from Chicago-based Studio ORD Joint Venture Partners, whose team includes architect Jeanne Gang, features lots of indoor trees and even patches of grass on the floor. Chicago-based Skidmore, Owings & Merrill, meanwhile, is proposing a naturalist design, playing up O'Hare's original designation as "Orchard Field." And Santiago Calatrava, famed for the Milwaukee Museum of Art and the never-built Chicago Spire, is proposing a redesign for the terminal and adjacent hotels and parking garages. Emanuel said the bold plans are needed for O'Hare to keep pace with airports around the world. Emanuel has not set a timeline but said he wants a design selected before he leaves office in May. The final plan is expected to add 25 percent more gate capacity and increase the total footprint from 5.5 to 8.9-million square feet. Construction is expected to start in 2021 and finish in 2028, and be paid for through gate and concession fees.